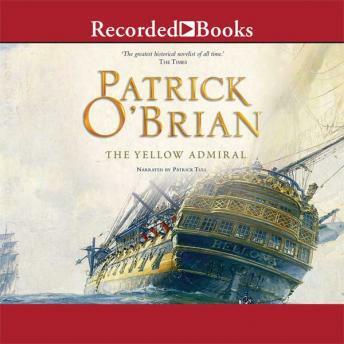 Life ashore may once again be the undoing of Jack Aubrey in The Yellow Admiral, Patrick O'Brian's best-selling novel and eighteenth volume in the Aubrey/Maturin series. Aubrey, now a considerable though impoverished landowner, has dimmed his prospects at the Admiralty by his erratic voting as a Member of Parliament; he is feuding with his neighbor, a man with strong Navy connections who wants to enclose the common land between their estates; he is on even worse terms with his wife, Sophie, whose mother has ferreted out a most damaging trove of old personal letters. Even Jack's exploits at sea turn sour: in the storm waters off Brest he captures a French privateer laden with gold and ivory, but this at the expense of missing a signal and deserting his post. Worst of all, in the spring of 1814, peace breaks out, and this feeds into Jack's private fears for his career. Fortunately, Jack is not left to his own devices. Stephen Maturin returns from a mission in France with the news that the Chileans, to secure their independence, require a navy, and the service of English officers. Jack is savoring this apparent reprieve for his career, as well as Sophie's forgiveness, when he receives an urgent dispatch ordering him to Gibraltar: Napoleon has escaped from Elba.